A completely new model name from Tom Kuhn: the No Jive 3 in 1 Rainbow in butterfly configuration. There have only been a handful of new models from Tom Kuhn in the last decade. Dave Hall suggested this model to Brad Countryman and Tom Kuhn, and they loved the idea enough that they made it a reality. 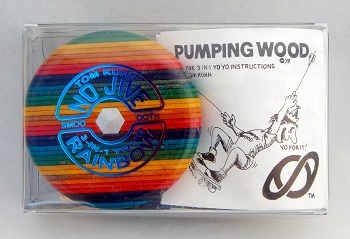 This model was exclusive to Dave's Skill Toys web store. Compare with the No Jive 3 in 1 Rainbow Tournament.